Bat Trang is a traditional handicraft village, which is famous for producing high quality ceramic products. With regard to origins, there are many legends and stories about the formation of the village. According to Complete Annals of Dai Viet, Bat Trang firstly appeared in 1352. On the other hand, according to the historical epic, people from Bo Bat Commune, Ninh Binh province settled in this land under Ly Dynasty (1010 - 1225). These people took advantages of a plentiful reserve of white clay in the village to produce ceramic products. From that time, Bat Trang is well-known for its traditional pottery. 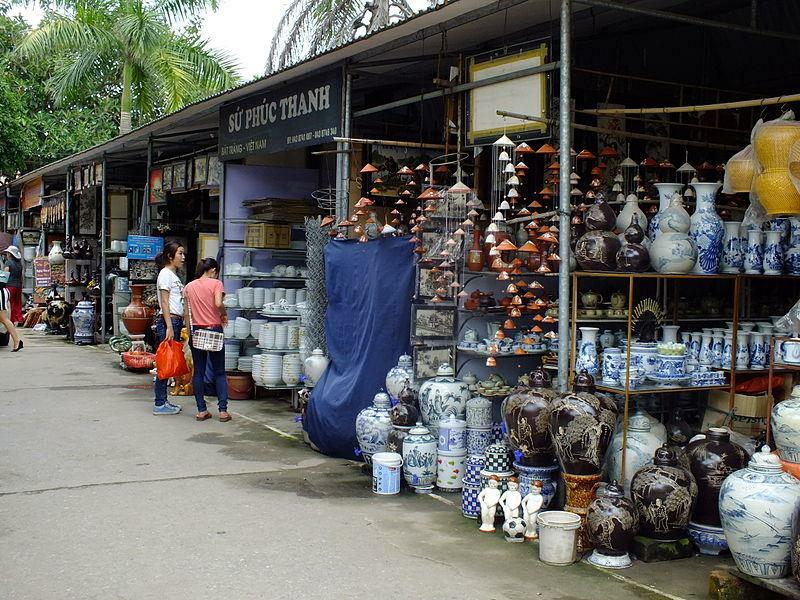 Nowadays, Bat Trang is not only famous for its ceramic products, but also well known as a tourist attraction in Hanoi. 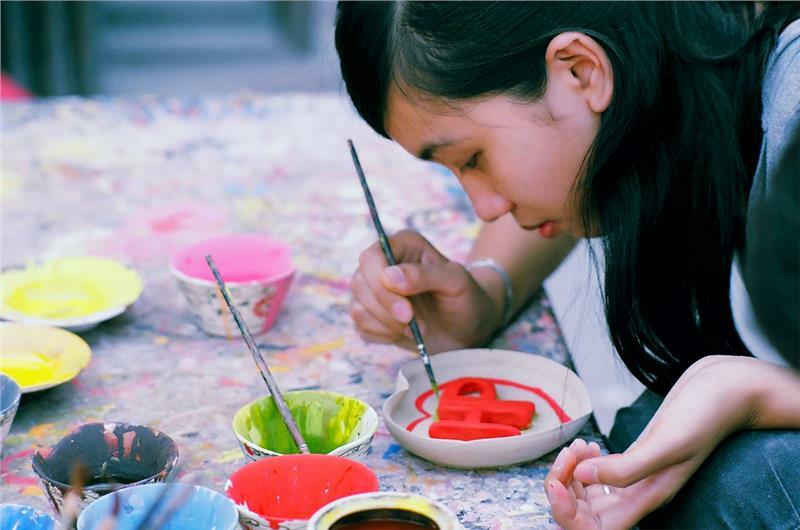 Visiting Bat Trang ceramic village, tourists can go sightseeing in unspoiled natural sceneries, witness the process of making pottery, try to make handmade ceramic products by themselves and bring their achievements to home. Go sightseeing in Bat Trang Pottery Village by sitting on a buffalo vehicle (a kind of vehicle moved by a buffalo) may be a very interesting and unforgettable experience of tourists visiting this land. 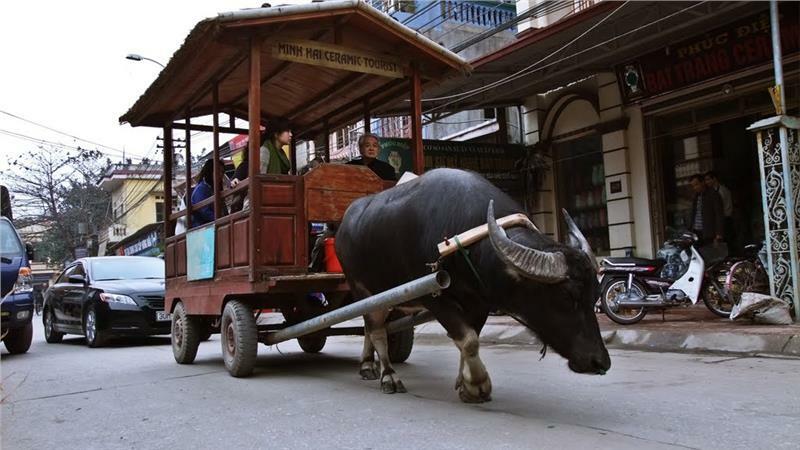 After arriving in Bat Trang, tourists can ask local people for renting a buffalo vehicle going around the village. The price of renting this vehicle is approximately ranging from 150,000 to 200,000 VND (about 10 dollars). Each buffalo vehicle can contain ten people. Sitting on this strange vehicle, tourists can enjoy the peaceful and untouched landscapes. They can also visit Van Van, a small gallery of ceramics of different periods and enjoy the beauty of the items displayed there. Another thing tourists should not ignore when visiting Bat Trang village is going shopping at the shopping center. The products sold in this place are quite diverse and beautiful including cups, wind chimes, paints, colorful bracelets and accessories made from ceramic materials, and so forth. If tourists take time to watch and find in this stuff, they can find some beautiful and exclusive items which are cheaper than ones in markets. A further plus point is that local people here are very friendly and hospitable, therefore, tourists can comfortably take photographs besides unique and beautiful items in spite of not buying anything. After walking and taking pictures, tourists can try to make a ceramic product by themselves with the very cheap cost, about 10,000 VND/person. Do not worry if you do not know how to make a ceramic product because the owners are always ready to help you to make a perfect one. If you want to bring your product to home, you just have to pay 20,000 - 25,000 VND for each product. Nowadays, Bat Trang ceramic products are famous for not only in Vietnam but also in other countries in the world. The products of the villages has been exported to some countries like Japan, Korea, America, and members of European Union since 1990. Besides, some products of Bat Trang ceramic village are stored in the world's large museums such as the Guimet Museum (France) and Royal Museum of Fine Arts of Belgium. According to the artisans of the village, the popular subjects of Bat Trang products are the image of dragon, phoenix, couplets, nature and people reflecting the the spirituality and philosophy of Vietnamese people. These motifs are carved exquisitely and skillfully which make Bat Trang pottery have outstanding and special beauty in comparison to other ones. Having natural landscapes and the specially aesthetic values, Bat Trang pottery village promises to be one of interesting attractions in Hanoi for tourists to explore. This is an ideal place for those feel bored with the crowded and bustling life of urban areas.